Keeping your vehicle maintained and problem-free can be a challenge, especially when parts start to wear out when you need your vehicle the most. Whether you are looking for routine auto service, tires, squeaky brake repair, or a smog test, Fisher’s Auto Service is the name you can count on. 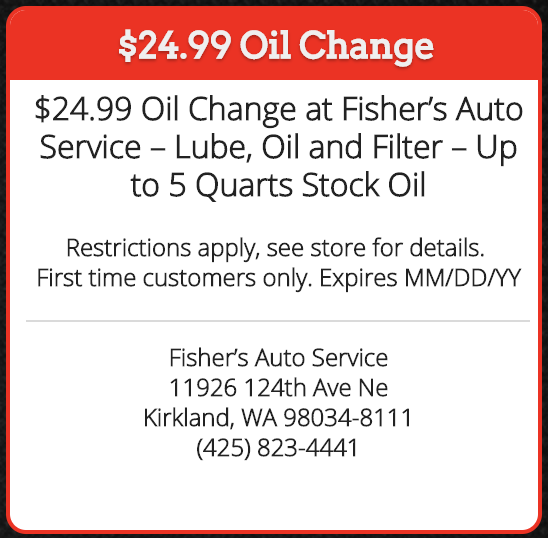 Fisher’s Auto Service provides a quality alternative to quick tune, tire shops and dealership service departments. We offer you the additional convenience, integrity and personal attention of a locally owned business in Kirkland Washington. Fisher’s Auto Service is active in the local community as well as being recognized nationally and statewide. We are a member of the Kirkland Merchant’s Association, and hold State and National memberships in the ASA: The Automotive Service Association.